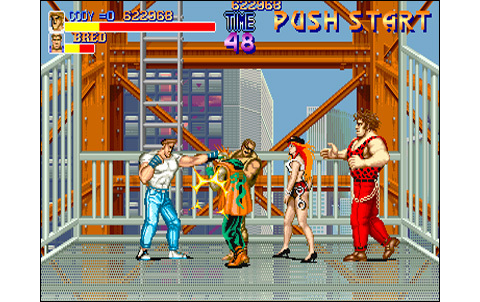 Right from the beginning, the game proposes a roster of three characters, each with his own fighting techniques, featuring a wide range of moves and throws, completely different from each other. 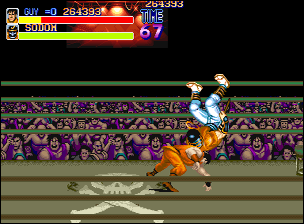 Technically, other rival games are completely outdated. 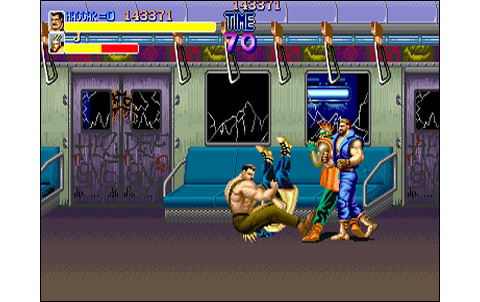 The excellent capacities of CPS allows Capcom to provide a game graphically better than any other before: Final Fight backgrounds are beautiful and varied, running through Metro City, and having players discover with pleasure the back streets, subways, sewers, bars and seaside... Large-sized sprites are also nicely drawn, and at the time look like the biggest ever seen in this type of game at the time, particularly for the player's characters. 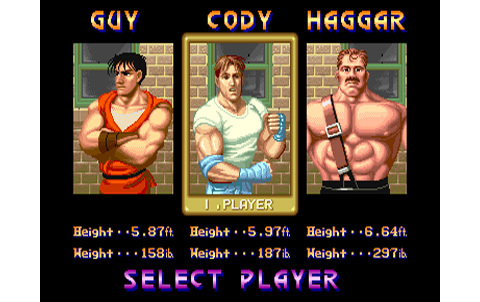 The animation is no exception, with smooth and fast moves for Haggar, Guy and Cody. This is unfortunately not the case for enemies, who we might think they're stiff as a poker... Being there only to be used as punching bags, it's not a very big deal. 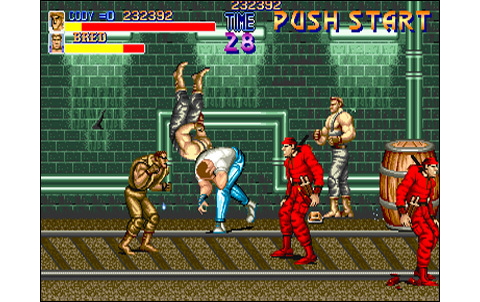 The soundtrack features well-chosen sound effects, few vocals - a little sleet - and cool musics to accompany the action. 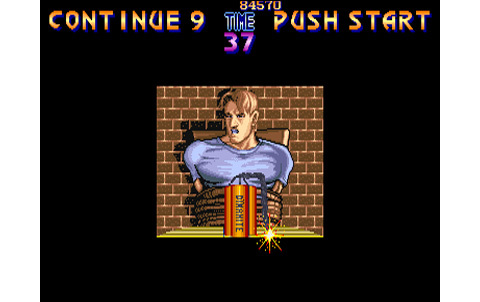 This is not a great part of the game, far from it, as often with the CPS and its average sound capabilities. No, the main asset of Final Fight is the gameplay. 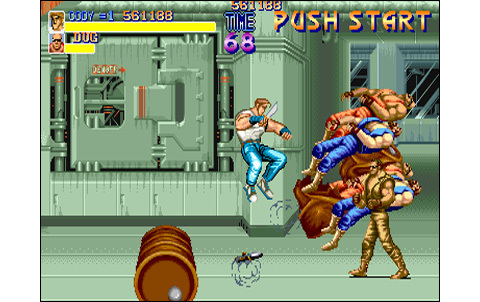 The game is flexible, with very good controls, a flow of enemies neither too large nor too small, keeping an intense action almost all along the game. Everything is very good graphically, and players have fun like crazy from A to Z, especially with cooperative play. 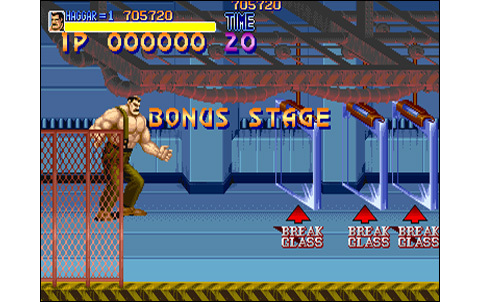 The range of moves for each character is large enough to never get bored, you can vary the attacks, projections, throws, combos ... Throughout the course, there are many different weapons (iron bar, pipe, knife, sword, etc...) and many decorative elements that can be destroyed. 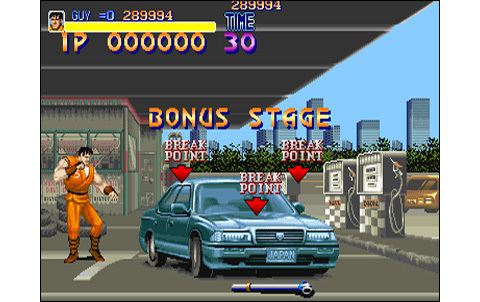 Capcom once again succeeds in making the game less linear as possible, and we're even granted bonus stages between levels, just to have some more fun! We recognize here the attention to detail and thoroughness of the editor's staffs. Clearing the game takes about fifty minutes, and that's not bad at all. 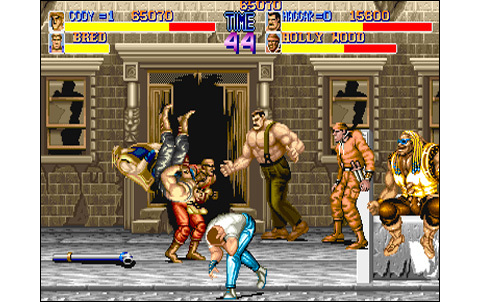 Sometimes the action can feel a bit repetitive, as in almost any other Beat them Up you will say, but overall, it 's fun and taking from beginning to end. 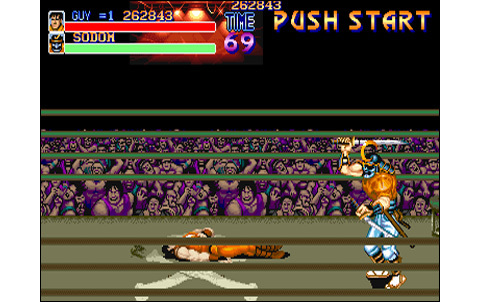 Some passages during advanced stages are a little boring, but overall, it's an insane joy to inflict beats to the ugly and perform wrestling moves. 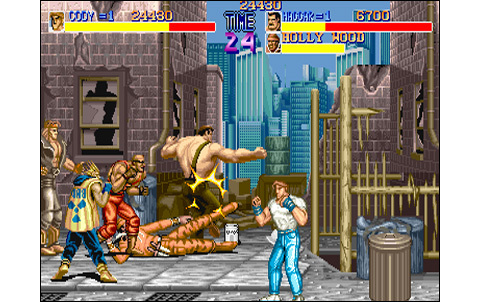 Final Fight is the real deal: even if the game would have been released years later, it would still have been a mega-hit, even with the firepower of a virulent competition. 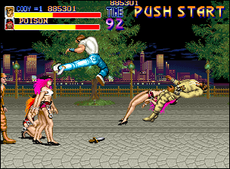 Capcom's hit packs every single element that provides fun and entertainment in a Beat them Up soft. 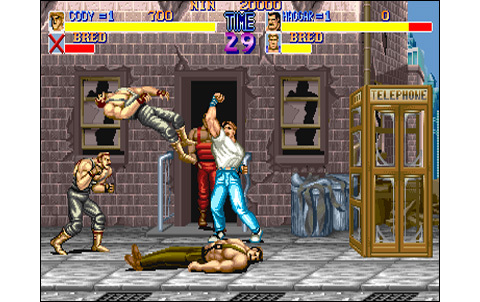 Often copied, never equaled, that's what one could say about this title: like Street Fighter II, it raises new basics in the world of fighting games. We can still find it a few little flaws: repetitive enemies, sizzling vocals, parts that are a bit linear... 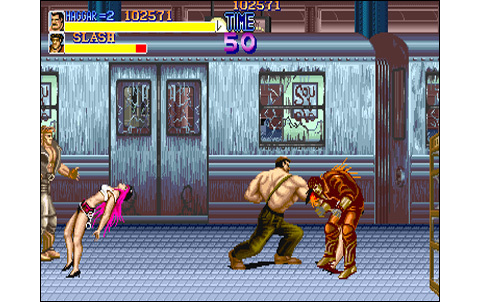 These are just details which can't alter the gorgeousness of the realization, and the powerful gameplay of Capcom's legendary Final Fight. Back in 1989, other competitors are completely out. Fine backgrounds, beautiful sprites, with a great variety of places. Playable characters are moving smooth and fluid, but that can't be said for the enemies. 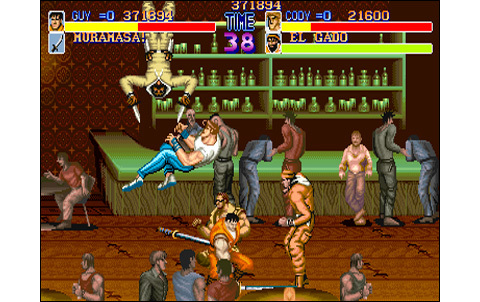 However, it's overall excellent, with also alive backgrounds and destructible elements. FX and musics are simple and average quality, limited by the CPS specs, but those fits well the action anyway. 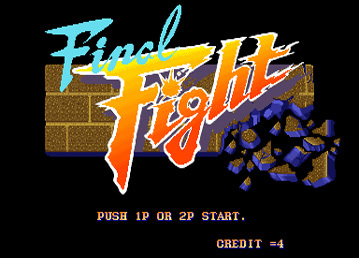 About fifty minutes to clear, it's quite long for this kind of game, especially in 1989. 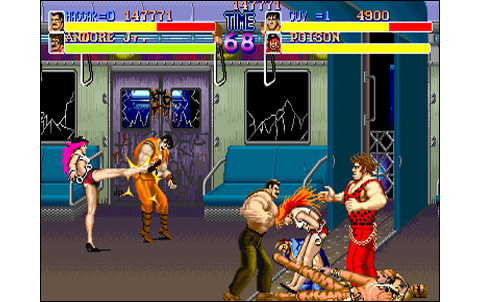 The game pack everything a Beat them Up lover could hope: varied moves, throws, jumping attacks, weapons, cooperative play, bonus games... The reference! 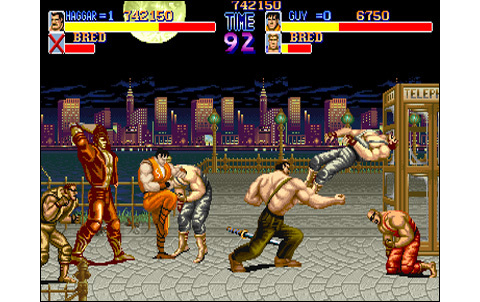 Providing so much pleasure to play, Final Fight is still THE Beat them Up, twenty years later. 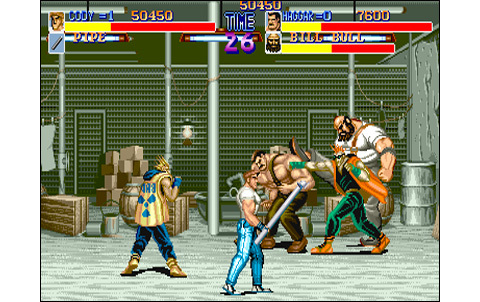 Burning Fight is the ultimate Final Fight clone, produced by SNK on the Neo Geo in 1991. 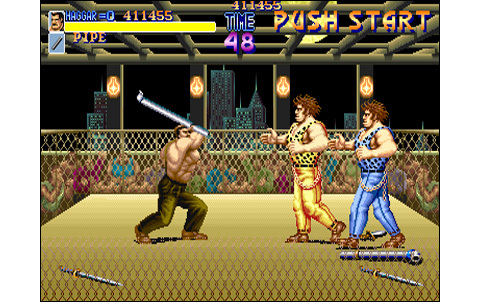 This game is a notch below the hit, with an average animation and a shorter lifespan, but it's still a honest Beat them Up, fun at will for two players.